About three days before the first day of school, I found myself wandering the empty isles of my local Target looking for left over school supplies. New shoes? Those can wait until they start school. Backpack? I’ll just have them use the ones from two years ago…. No one will notice. Pencils, markers, construction paper, folders, binders? Well, I found most of them. They will surely survive the first week with what I was able to find. It’s that time of year again. Kids are excited about new wardrobes and shoes that cost more than my electric bill – and parents around the world are preparing to celebrate. Don’t deny it. I know you are one of them. This little fact does not make you a bad parent. It makes you REAL. It’s time more of us admit we can’t wait for our kids to go back to school. I love my children more than life itself. There isn’t anything I wouldn’t do for them. 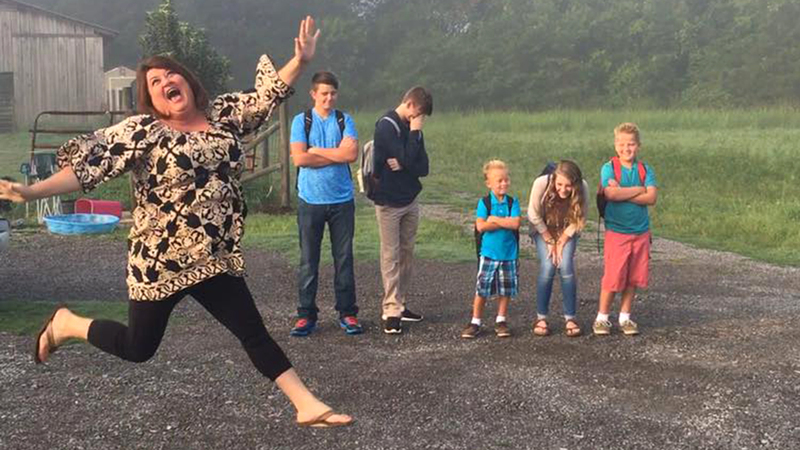 Including a happy dance as they walk up to school that first day. Two and a half months is a LONG TIME. We made good memories this summer – we really did. But I have not seen the floor of my pre-teen’s room since June 1st. Then there is the fighting, whining, and boredom. And why is it during the summer months, doors are no longer an issue? Cabinets, pantry, refrigerator, back door. All left open for 11 weeks!! Leave on time. Set your alarm early if you need to. Just make it happen. Morning drop-off is not the time to have a conference with your child’s teacher. Make an appointment. Do not blame being late on your kiddos. All this does is start their day off on a bad note. School snacks should not involve a donut or cookie. Helping with homework does not equal you completing the entire thing. Every teacher can tell when it’s not the child’s work. Wear clothes when you go to your child’s school. Pajamas are embarrassing even if they tell you they don’t care. Follow the drop off and pick up rules. Illegal turns and no parking zones are not optional – you are not the exception. Install a smart security system at your house. (Yes, I know I work for a company that sells systems, but I am also a mom who uses one) Having a smart lock eliminates the lost key problem. Alerts to your phone will let you know your angels arrived home safely. A Wi-Fi camera will allow you to peek in on your children to ensure their homework time is not actually TV time. CLICK HERE to let us help you with this option! The first few weeks of a new school year will always be stressful – even if you thought ahead and meal prepped (I forgot to grocery shop). Transitioning from leisurely days filled with bike riding and TV to planning and scheduling is difficult. So stay calm, plan your weeks, and make sure you set aside time to go out and relax with your friends.